Revised by: Dan Remley, Field Specialist, Family and Consumer Sciences. Bridgette Kidd, Healthy People Program Specialist, Family and Consumer Sciences. Pat Brinkman, Extension Educator, Family and Consumer Sciences, Fayette County. Beth Stefura, Extension Educator, Family and Consumer Sciences, Mahoning County. Original author: Rose Fisher Merkowitz, Extension Educator, Family and Consumer Sciences, Highland County. Nutrition and fitness is an important part of a happy and healthy child's life. Lifetime food habits are developed as a child. Help your children develop good eating habits by teaching them to enjoy foods that are good for health and fitness. Children are likely to have a good appetite when they have enough sleep, exercise, and nutritious food. Remember, a child's appetite will vary from one meal to another and from day to day. When children are not hungry, don't force them to eat, and don't worry about it. This is natural. The important thing is to provide healthy foods when your child is hungry. You decide what is available, and your child should be able to decide how much to eat. To promote good appetites and digestion for your child, encourage active play, especially in fresh air if the weather is appropriate. Set a good example for your child by eating a variety of foods and getting plenty of exercise yourself. Show by example—Let your child see that you enjoy eating whole grains and vegetables. Go food shopping together—Talk with your child about where foods come from, and let your child make healthy choices at the store. Offer the same foods for everyone—Not only will this make fixing dinner easier, it will also help your child see that others eat healthy foods too. Reward with attention, not food—Comfort and reward your child with hugs and talks instead of cookies and candy. Focus on each other at the table—Turn off electronics. Let dinner be a fun time with the whole family. Limit screen time—Being active is an important part of a healthy life, so turn off the TV, computers, video games, mobile phones and tablets, and play games as a family. Encourage physical activity—Make family time fun by playing games, riding bikes, playing at the park, and being outside. Everyone in the family will feel better! Children need well-balanced meals at regular hours. Below is the MyPlate for kids. Use this as a guide for your reference. 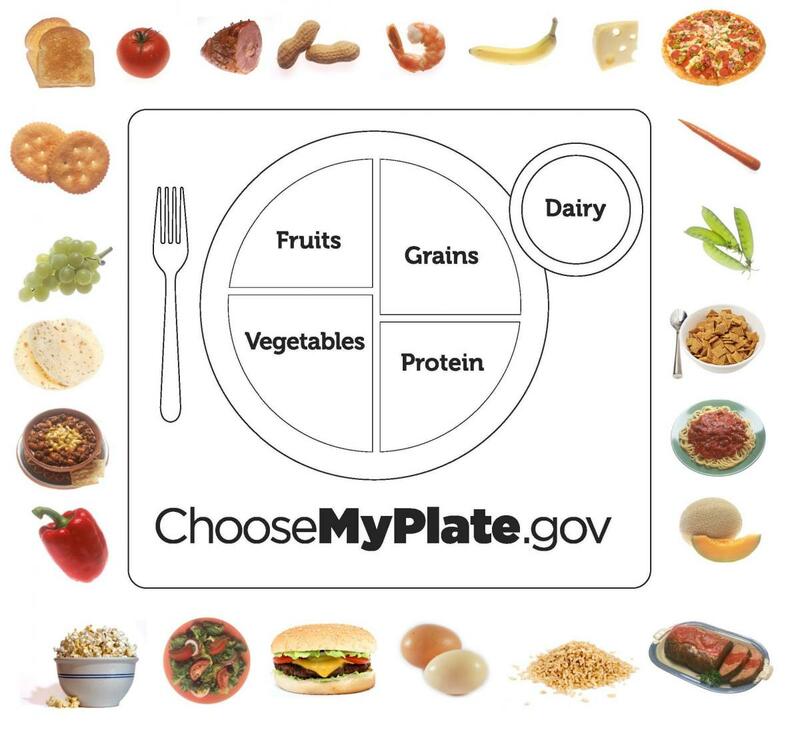 This is MyPlate. It shows the food groups and how you should build a plate. Color the plate. Draw a line from each food to the food group in which it belongs. Some foods may belong to more than one group.